We are going to tell you our story as it relates to this paper. Often when we use a story path that focuses on the present…the past….and the future. and use” in the current issue of ANS. We are honored to be in this retrospective issue. Moving to PAST, we first met and engaged with each other in 1979-1980 as teacher (Smith) – student (Liehr) while Liehr was in her Masters program at Duquesne University in Pittsburgh, Pennsylvania. The 1999 paper in ANS was the impetus for our textbook, Middle Range Theory for Nursing, first published in 2003. The book was written to create a resource for scholars wishing to use middle range theory in practice and research. The 1999 paper was also the impetus for this 2017 paper, allowing us to consider middle range theory through the lens set forth nearly 20 years ago. And now, the FUTURE….the 4th edition of Middle Range Theory for Nursing is in the works and we continue to teach students about the usefulness of middle range theory. We are offering a short video recording of current PhD students at Florida Atlantic University, Christine E. Lynn College of Nursing who are considering the relevance of middle range theory as they immerse in developing ideas to guide their research. The foremost recommendation in “Middle range theory: A perspective on development and use” is to “stay with the theory”. We believe that persistence and scholarly engagement over time has the potential to effectively shape disciplinary knowledge. Our story highlights and brings to life this belief. Thank you for sharing blog-time with us. This is excellent! Thank you so much, Drs. Liehr and Smith, for sharing. The textbook, Middle Range Theory for Nursing [sorry — the blog won’t allow me to italicize], and the articles you share are valuable contributions to nursing. I especially appreciate your paving the way for budding nurse researchers to remain tenacious and publish findings to help grow our discipline’s body of knowledge. I have to say your work has helped me make sense of middle range theory by explaining the processes in easy-to-understand language. In short, you make theory manageable. Where I once was intimidated by the thought of applying theory, I find that now I am thinking in terms of how various theories might apply to my own topic area. I am grateful to you for your contributions. Thank you Susan….It is so good to hear from you and know that our work is helping make theory more manageable. It is JUST what we hope to do….in the process of passing theory along. Thanks too for taking time to post on the blog – you may be our one and only post but what a good one and only post!!! The challenge now is to spread this knowledge with my students and support them in scholarly inquiry to research and use the many middle-range theories in their nursing practice. 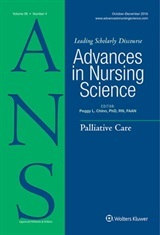 I recommend your text as a “must read” for nursing scholars to grasp the significance of research and link the meaning of real-life clinical practice in building the science in nursing. Linda….I THOUGHT I had replied to this post but I don’t see a response here….so, thank you for your comment and your “must read” endorsement….one of the major recommendations in this paper is that documentation of the use of middle range theory as a guide for practice is warranted. It sounds like you are well-positioned to take up that challenge with your students!!! I am a PhD student in the College of Nursing at the University of Tennessee. Dr. Liehr spoke to our middle-range theory class several weeks ago. Dr. Liehr emphasized the need to use middle-range theory in practice, which is echoed in the title of Dr. Chinn’s post. Dr. Liehr also discussed Story Theory with us. Several points that Dr. Liehr made stood out to me: the patient as expert, intentional engagement, and using Story Theory to resolve a health issue. For our final course paper, my topic of interest is bedside shift reporting (BSR). I have been considering how I could apply Story Theory to BSR. Several nurses I’ve spoken with have said they are uncomfortable sharing the details included in report in front of the patient. I think a flaw in nurse shift report is the lack of the patient’s story. I believe it is more than simply understanding the patient’s perspective. It is hearing the patient’s story and developing a nursing plan of care that addresses elements from the story. The goal is resolution of the health issue. While the short timeline of BSR does not allow enough time for a patient’s full story to be heard, engaging the patient in BSR opens the door. A vignette may be heard in BSR. This provides an opportunity for the nurse to return and hear the patient’s full story. We must remember that the patient is the expert, and BSR provides us with an opportunity for intentional engagement. Thank you Jean for this thoughtful consideration about the importance of Story for BSR….I want to suggest that a focus on the patient’s health challenge may be a good place to start….what matters most right now about the health challenge that the patient is facing. If BSR could include this information and allow the patient to engage in shaping it by being included in end of shift report, I think it could be transformational for the patient and for the health care providers….and, maybe for the discipline! Thank you Dr. Liehr. Your suggestion to focus on the health challenge of the patient has helped me refine my approach to my paper. Drs. Liehr and Smith, one point you make in your recent (2017) article entitled “Middle Range Theory: A Perspective on Development and Use” is the need for inclusion of diagrammed models of middle range theories. I think this is one of the more important criteria for development of middle range theory, and it is especially important to help nurses understand and make use of theories in nursing practice. Certainly, those who tend to prefer learning by visual methods may more easily grasp the conceptual relationships and propositional statements if a model is included. However, I think it is important to also include clear narrative description of the conceptual relationships and proposed “movement” occurring within the diagrammed model, perhaps even as a brief caption under the model diagram. I say this because I think the idea of incorporating theory into practice can be sometimes intimidating. From my own personal experience, I find that many times I read nursing research articles that do not incorporate a diagrammed theoretical model, and the described theoretical relationships seem quite complex. Toward this end, perhaps nurse scientists can take steps to bring theory a bit closer to bedside practice. I am in favor of the steps you share to make it as easy as possible for others to grasp and incorporate theories, both in research and practice. Also, on another note, I have a question about your appeal to include middle range theory in interdisciplinary collaboration. I can see how doing so might lead to potential conflicts in melding philosophical perspectives of two (or even more) very different disciplines (e.g. engineering and nursing, or architecture and nursing). How do you propose addressing this type of situation? Would it be appropriate to state that the phenomenon is viewed simultaneously from two different philosophical perspectives, and then provide an explanation for each? Susan, Dr. Smith and I were very pleased to see your thoughtful posting. We are together in West Virginia now working on the 4th Edition of the Middle Range Theory book….so, we have had some good dialogue about your ideas. First…about the challenge of capturing “movement” expressed in a model of a theory on a page, a 2-dimensional space – it is very hard to do this but your idea about a caption that provides some insight is useful. If you look at the model for Story Theory, you will see that we tried to capture the dynamic process of story gathering in that model – your posting is calling us to look at the middle range theory descriptions in our book to see that they complement the models. Next, is about interdisciplinary collaboration. You ask us how to “meld” philosophical perspectives. First of all, there is great strength in melding but it demands that nurses are grounded in our disciplinary perspective when seated at the table. It is important to have open authentic dialogue with our collaborators, keeping the good of our patients in focus. With this focus AND authentic dialogue, we can participate in a way to serve those in our care. Finally, we challenge you to take your ideas to your practice setting, try them out and then, write about what you learn so that you can inform nursing practice with solid evidence from the field. We thank you for sharing your ideas with us. To follow a previous post, I am also a PhD student in the College of Nursing at the University of Tennessee. My area of interest is health care access for vulnerable populations with chronic conditions. The pragmatic utility of self-management theory, at the middle-range level of abstraction, seems a logical fit for nurses to use in enhancing therapeutic behaviors that are critical to improving patient health outcomes and quality of life. Nurses offering access to care while promoting innovative models and strategies that support self-management.has significance in impacting real-world health issues around the globe. Your text has served as an invaluable guide for me in developing my skills in operationalizing middle-range theories in real-life settings. For example, providing support in collaboration with patients to self-manage disease and promote health. Additionally, thank you for your time recently in speaking to our class about middle-range theories. to broaden our understanding of the benefit of middle-range nursing theory. Linda….good to hear from you again. I can see that you are actively working on ways to use middle range theory and it would be wonderful if you could build on a foundation of a middle range theory to support your interest in health care access for vulnerable populations. It is a very important topic…..so, I hope, one day to see your publication taking middle range theory to practice or research, addressing access for this population.